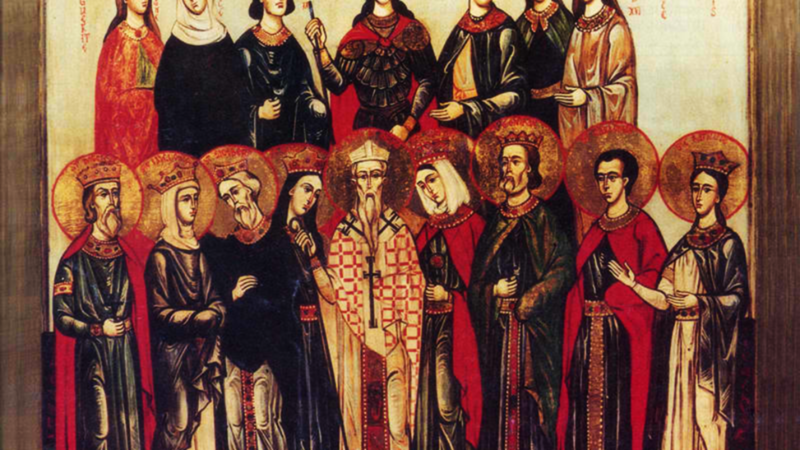 AGAPIUS and COMPANIONS (MARTYRS of CIRTA), a group of clergy and laity martyred in Cirta in Numidia (present-day Tunisia), during the persecutions under Valerian (r. 253 – 260). According to the Roman Martyrology those martyred with St. Agapius were: Antonia, Emilian, Secundinus, Tertula, and a woman and twin children whose names are no longer known. AVA (AVIA), a niece of King Pepin the Short (r. 751 – 768), who was miraculously healed by St. Rainfrede (8th October) of blindness which she had suffer since childhood. In time St. Ava, received monastic tonsure at Denain Abbey in Hainault, and later serving as its Abbess. St. Ava reposed circa 845. DANIEL, (Ninth Century), according to a legend of suspect veracity, St. Daniel was native of Asia Minor who became a hermit at an unknown location in present-day Spain. He is listed as a martyr, though the circumstances and location of his martyrdom are unknown. DICTINUS, (Fifth Century), St. Patrick's (17th March) first convert in Ireland, St. Dictinus was the son of an Irish chieftain and a swineherd in his youth. He gave St. Patrick the land at Saul for his first church. ENDELLION, (Sixth Century ? ), St. Endellion was one of the daughters of St. Brychan of Brycheiniog (6th April) and sister of St. Nectan (17th June). According to legend she was the Goddaughter of King Arthur. St. Endellion lived as an anchorite in Cornwall and is commemorated by the church and village of St. Endellion in north Cornwall, England. FIACHAN (FIANCHINE), (Seventh Century) , St. Fiachan was a monk under St. Carthage the Younger (14th May) at the famous Lismore Abbey in Co. Waterford. He is especially remembered for his obedience and gift of prayer. GUNDEBERT, (Eighth Century), the husband of St. Bertha (1st May) and brother of St. Nivard (1st September). Towards the end of his life, St. Gundebert separated from St. Bertha by mutual consent. He then went to Ireland where he received monastic tonsure. St. Gundebert met his martyrdom when his monastery was sacked by pagans, and he was killed. PAULINUS of BRESCIA, a sixth century Bishop of Brescia. Consecrated circa 524 he served the See until his repose in 545. SENAN, (Seventh Century), St. Senan was a hermit in northern Wales about whom there is no information extant. SEVERUS, an early fifth century Bishop of Naples. A renowned wonderworker, St. Severus once brought a man back to life, so he could testify on behalf of his wife who was facing unfounded charges. St. Severus reposed in 409. TORPES, although the subject of many early Lives, which are almost complete devoid of fact, little is actually known of St. Torpes. As far as is known he was martyred in Pisa, circa 65, during Nero’s (r. 54-68) persecution of Christians. The town of Saint-Tropez in France is named for him. WILFRID the YOUNGER, after receiving his education at Whitby Abbey under St. Hilda (17th November), St. Wilfrid attached himself to St. John of Beverley (7th May). He later succeeded St. John as the last Bishop of York, as the See was elevated to an archbishopric during the time of his successor. St. Wilfrid resigned the See in 732, retiring to Ripon until his repose in 744. He was buried at Ripon, though it is possible his relics were later translated to Canterbury in the mistaken belief they were those of his more famous namesake (12th November).